When a Texas family needed more space, they turned to the trees — and to a man named Pete Nelson, who's more in tune with the trees than just about anyone. That was the first episode of Treehouse Masters, an Animal Planet show that portrayed Nelson and his crew building a treehouse for the family. 11 seasons later, it's safe to say the show is a hit. 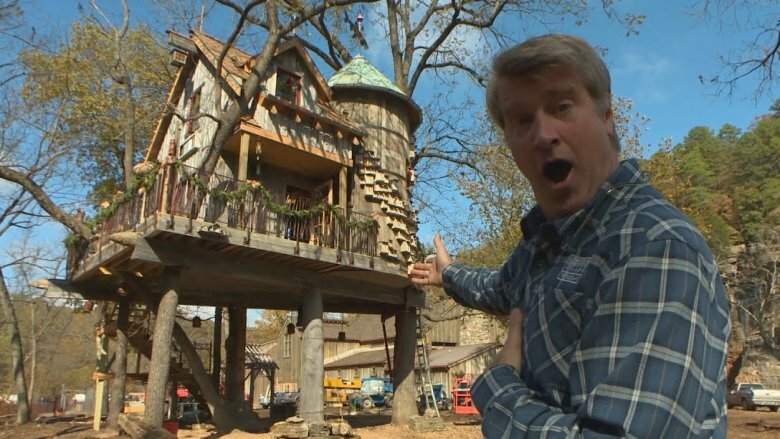 Treehouse Masters follows a simple premise: somebody wants a treehouse, and Pete Nelson builds it for them. Nelson runs his own business, which encompasses everything from building treehouses on TV to running treehouse hotels to selling books about how to build your own treehouse. 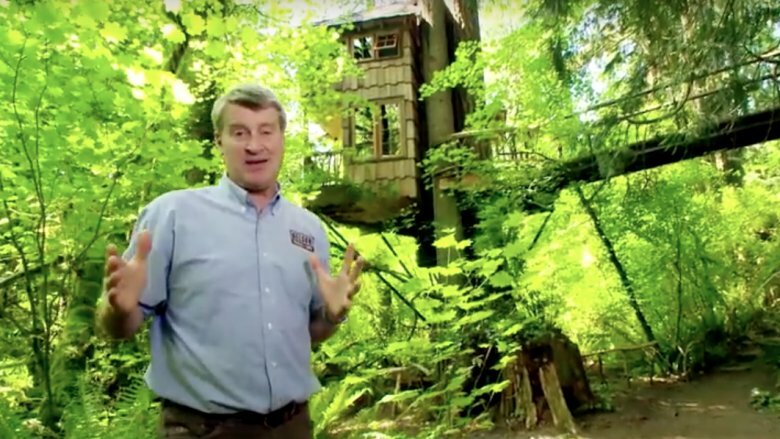 Let's take a closer look at Pete Nelson, the charismatic Treehouse Masters host, and what happens behind the scenes of his show. This is the untold truth of Treehouse Masters. Some people grow up dreaming of having their own TV program where they get to run the show, have cameras follow them around all day, and let thousands of people around the world get an inside glimpse at their life. Pete Nelson wasn't one of them. The star of Treehouse Masters has an economics degree and worked as a carpenter before Animal Planet came knocking, and he never wanted a show — reality TV just wasn't his thing. "I've seen these reality shows, and you all fight, and it's fake, and I hate it," Nelson told House Beautiful. That was his initial reaction when he was approached by a production company in 2011. Tiny houses were becoming a trend around that time, and the company felt that Nelson's custom treehouses would be a crowd pleaser. Nelson slowly warmed to the idea of a show, but he had one condition — zero drama. The producers gave him their word that his show would be different, and finally, Nelson agreed. In hindsight, he realized a show about treehouses would be pretty hard to wring drama out of, anyway. "We're building forts, for crying out loud. It's hard to fight," he pointed out. 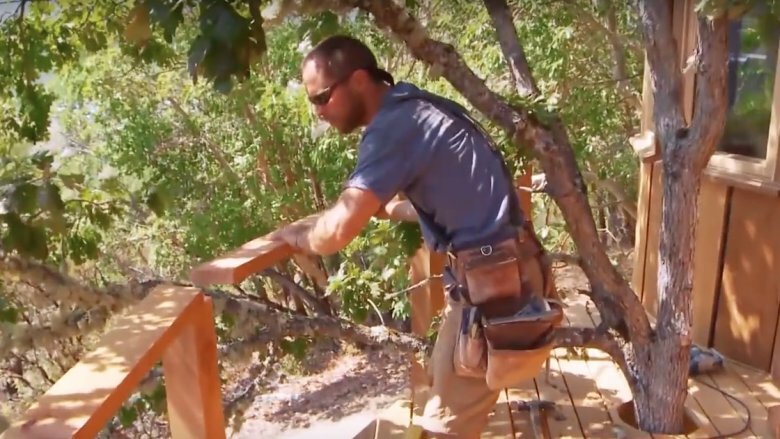 In 2015, the Oregon Construction Contractors Board fined Nelson and his company $5,000 for a treehouse the crew built in Neskowin, Oregon, without a license. 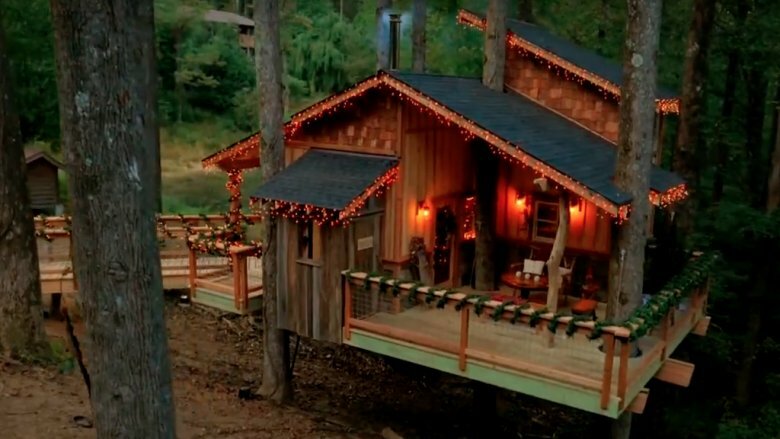 Since the treehouses built on the show are meant to be residences instead of simple children's playhouses, they require a contractor's license just like a home on the ground does. "While working in Oregon, our company purchased supplemental workers' compensation coverage which comprehensively insured the talented team who worked on the project," said a spokesperson for Nelson Treehouse and Supply. The company didn't have a CCB license, however, and that made all the difference. This wasn't Nelson's first offense, either. The Oregon CCB had also fined the company $1,000 in 2014, when they worked on a treehouse in Central Point without a license. "Contractors need to know how to operate legally in whatever state they are doing business in," CCB Enforcement Manager Stan Jessup said. In these two cases, however, it appears that Nelson Treehouse and Supply did not. Recycled and re-purposed wood is what Pete Nelson and his team prefer, although budgets don't always allow. "The prices for quality salvaged lumber shot through the roof in the early 2000's and now seem to be headed that way again," Nelson explained in 2013. He loves salvaged materials because they can make treehouses look rustic, but the houses he builds on the show need to be sturdy and durable, and salvaged wood doesn't always do the trick. Nelson has collected salvaged materials for years, and he knows there's more to it than meets the eye. Cleaning the materials jacks up the price, and even storing lumber can be expensive — it has to be kept dry, especially in Nelson's rainy Washington hometown. Salvaged timbers that are being used for structural elements also have to be completely free of knots and defects. So while Nelson Treehouse and Supply likes to use re-purposed wood, it can be difficult to find just the right materials. 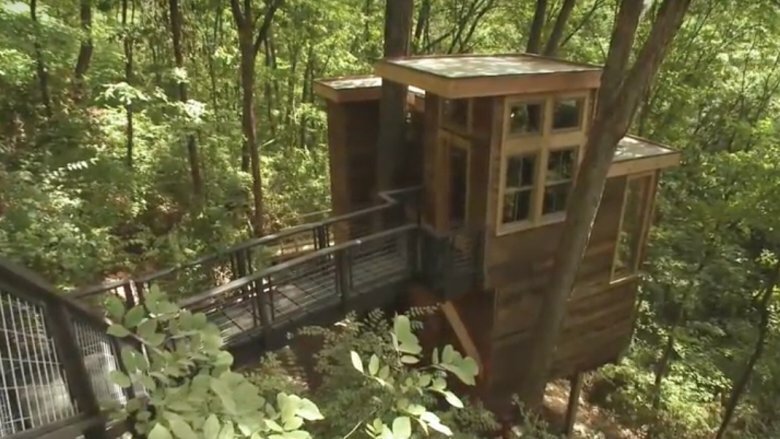 Sometimes, treehouses built by the Treehouse Master are more expensive than regular houses. According to Steve Bowler, a former senior field producer for the Animal Planet show, the treehouses that are built on-screen generally cost between $250,000 and $600,000. It's a far cry from the $50 a father might spend on some nails and wooden planks to put up a treehouse over the weekend. But these aren't your average backyard treehouses — Nelson's creations are more like luxury homes, with kitchens, air conditioning, and more. Take this treehouse, for instance, which the show dubbed "the coolest treehouse ever built." A bridge leads you through the branches to a glass-paneled door that opens into a small entryway with a river rock floor (number 26 on the list of things your backyard treehouse doesn't have). And inside the main treehouse, the rustic bedroom looks like something straight out of a mountain resort. When you add up the materials, labor, and everything else that goes into the creation of one of Nelson's masterpieces, it's no wonder that they're so pricey. We understand… but that still doesn't stop us from being upset that we'll never get one. Nelson and his crew have been busy over the past several years — as of an October 2018 interview, Nelson had over 350 treehouses to his name, and he explained that each one is different. Since each of the treehouses on the show is built for a different family, that family's tastes and preferences play a big role in the treehouse Nelson ends up designing and building. This Christmas treehouse, for instance — described by Nelson as "550 square feet of joy" — has a creative bark siding and is cozy and charming inside, with a well-equipped kitchen. The treehouse Nelson built for country singer Brian Kelley, however, couldn't be more different. It's a boxy structure connected to the main house by a bridge. Inside, there's a round bedroom designed around a circular bed. It fits the owner's personality, just like every other one of the 350 treehouses Nelson has been commissioned to make. 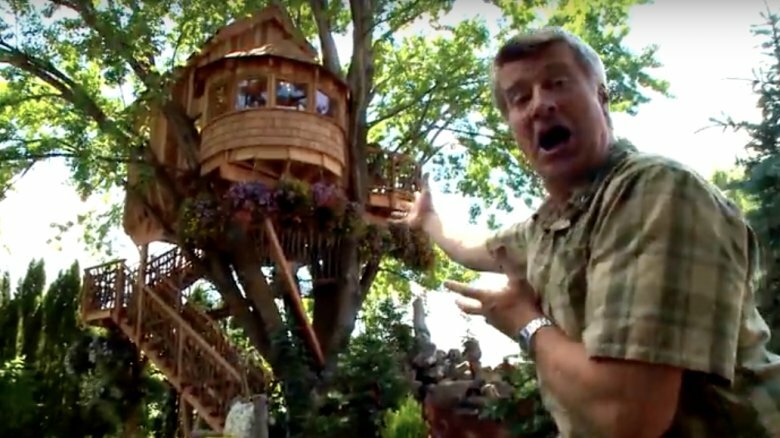 Ronald Rae, a former lawyer who lives north of Spokane, commissioned Treehouse Masters to build a $100,000 treehouse for him in 2013. Located south of Perkins Lane and on the southern part of the Magnolia bluff — an area that's not accessible by vehicle and is a bit of a walk from the closest road — the treehouse looks like a lighthouse. It has a kitchenette and queen-sized bed, plus beautiful views of Mount Rainier. But this treehouse isn't as charming and perfect as it might seem. When Nelson's crew built the treehouse, they didn't have the proper permits, so the city sued Ronald Rae in 2014. Rae had to pay a $10,000 fine and needed to either get the permits in order or demolish the treehouse. Rae contested that although the area was known for avalanches, the land under the treehouse was stable, and the property was put up for sale. The asking price is $475,000, and since it's not a house, there's no mortgage available — meaning the treehouse is cash-only. 30 minutes outside Seattle in the forest along Raging River, there's a place like no other. "Almost 12 years ago to the day, I came upon some bushes," Nelson told Seattle Refined in 2018. 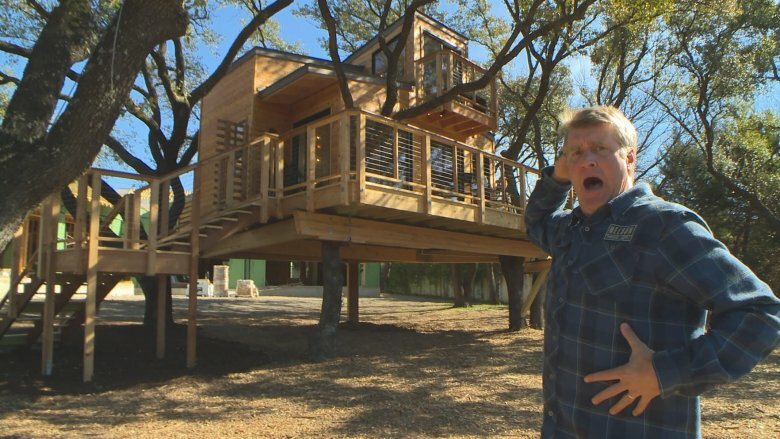 And because he's Pete Nelson, he saw something in that Preston property that no one else would have — the perfect place to build treehouses that people could come and stay in. Today, TreeHouse Point is a private event center and overnight retreat for weddings, meetings, or just to relax for a night. There are six treehouses available for rent, each with its own name and personality, plus a central Lodge and an event space (as well as two bathhouses). Each treehouse is heated, while the Lodge has breakfast, Wifi, and more. 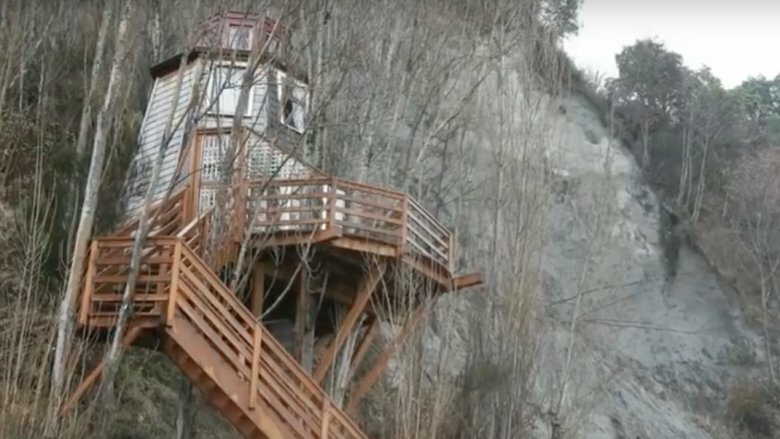 Fans of the Treehouse Masters show can enjoy spending a few nights in this romantic, hidden getaway spot. And if getting all the way up to Washington is difficult, there's a sister property in Texas. Treehouse Utopia has four rentable treehouses with views of the Sabinal River. The fast-paced nature of the show — building houses, climbing trees, planning the next episode — suits Nelson well. "I've got ADHD, so you've got that 'hyper' in there. I've gotta do something, or I'll get bored," he told House Beautiful. ADHD, attention deficit-hyperactivity disorder, is a condition that varies widely from person to person. ADDitude defines it as "a neurological condition defined by a consistent pattern of inattention and/or hyperactive impulsivity that interferes with daily functioning in at least two settings — for example, at school and at home." It's also more common than you might think, with at least 4.4 percent of the adult U.S. population carrying the diagnosis. Luckily, it looks like Nelson has the perfect career — one where he can stay constantly busy and channel his energy into a new challenge every day. 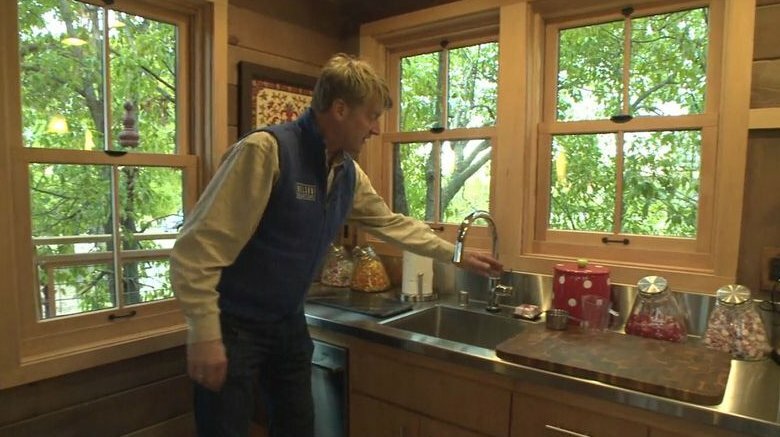 Between Treehouse Masters, the properties he manages, and all of the other ventures involved in the family business of Nelson Treehouses, we don't think there's any danger of Pete Nelson getting bored anytime soon. 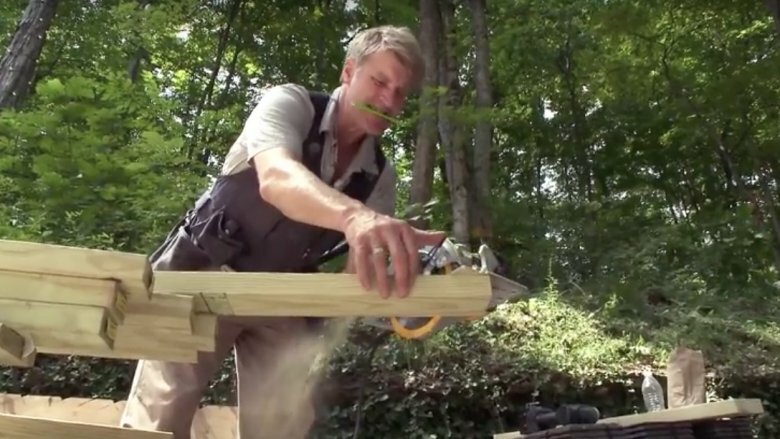 A carpenter, a reality TV star, and even an author — is there anything Pete Nelson can't do? That's right: Nelson is the author of four books. First came The Treehouse Book, a 2000 release written by Nelson and his wife Judy that highlights unique treehouses across the nation. Next was Treehouses of the World, which covers 35 treehouses worldwide and explains the mechanics of how treehouses are made. In 2009, a follow-up book called New Treehouses of the World was published, focusing on sustainability and encouraging its readers to get outside. Finally, Nelson's most recent book is titled Be in a Treehouse and was published in 2014. The book uses 21 of Nelson's own treehouses to discuss the best practices when it comes to building a treehouse without hurting the trees — great for "professional contractors" and "armchair dreamers" alike. The Nelsons sell these books — along with more Treehouse Masters merch, puzzles, calendars, and coloring books — on their website. 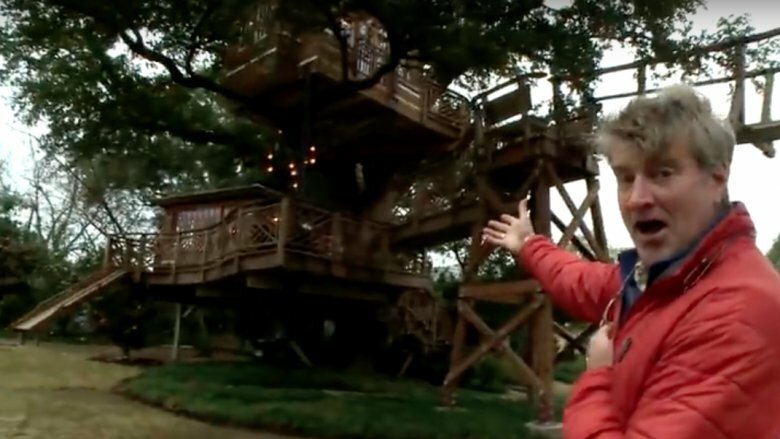 The groundwork for Treehouse Masters was laid many years before the first episode aired in 2011. Nelson built his first major treehouse when he was just 25. In reality, though, things started even earlier than that. "I first fell in love with treehouses at age five when my dad built me an adventurous treefort behind the garage at our home in New Jersey," Nelson said. He and his family had read an abridged version of the novel Swiss Family Robinson and were inspired by the nature-based illustrations, prompting Nelson's father to build a treehouse. "The world of treehouses, carpentry, and design continued to captivate me through college." And after college, Nelson wasn't slowing down. He built his first "adult" treehouse at 25 years old. His blueprints were more sophisticated than the plans he'd made as a kid. "This one that I had imagined as a 25-year-old was a little bit more," he recalled. "It was still small, but it had a brick fireplace for insurance." 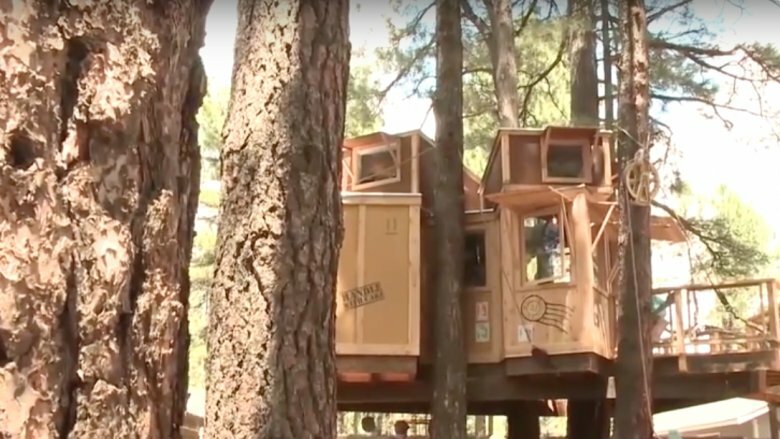 Eight-year-old AJ, an Arizona boy who has spinal muscular atrophy, went through the Make-A-Wish Foundation to express the one thing he wanted most: a treehouse built by Pete Nelson. And when the foundation reached out to him, Nelson delivered. AJ's treehouse is built in the style of one of his favorite movies, The Boxtrolls. Sitting nine feet high on five ponderosa pine trees, it has a bunk room, desk, secret room, and a big deck. Inside, the treehouse is filled with amazing murals that all relate back to the movie. AJ's community was instrumental in helping build the treehouse. The house needed a 108-foot wheelchair ramp so AJ could get into the house, and the local fire department stepped in — almost 60 volunteers spent two weeks building the ramp. "Building for AJ was such a special, memorable experience. A huge thank you to everyone involved," said Nelson and his team.